The hot toddy is great but sometimes you want that warm, soothing mix without the liquor. That's when you can turn to the hot not toddy. This recipe is the nonalcoholic version of the toddy and, yes, it really is just an enhanced cup of warm tea. However, it's a fabulous drink and perfect for cold nights. To make this toddy, simply choose your favorite hot tea and watch it transform it into a delightful winter mocktail by adding the sweetener, citrus, and spices of the traditional toddy. Not only is it a great option for nondrinkers but it's one that you can share with the kids. It is also a soothing relief for cold symptoms—kind of like chicken soup. In a warm Irish coffee glass or mug, add the honey, lemon juice, and spices. Top with hot, freshly brewed tea. While waiting for your tea to brew, pour the extra water from your teapot into the glass or mug you will be using. This warms up the mug and keeps your toddy hot longer. Dump the water before building the drink. Be sure to adjust the honey and lemon to your taste. You might even find that your preferences change based on the type of tea you're brewing. If you have whole spices—particularly the cloves, which are most often whole—you can contain them in your mug by placing them in a tea ball or similar strainer. You can also skip the ground cinnamon and use a whole stick instead. It doubles as a stir stick! Add other spices as you see fit. Ginger is a great addition when you have a cold and can be added in ground, paste, or sliced form. Allspice, anise, and vanilla (part of a bean or a dash of extract) are good options as well. 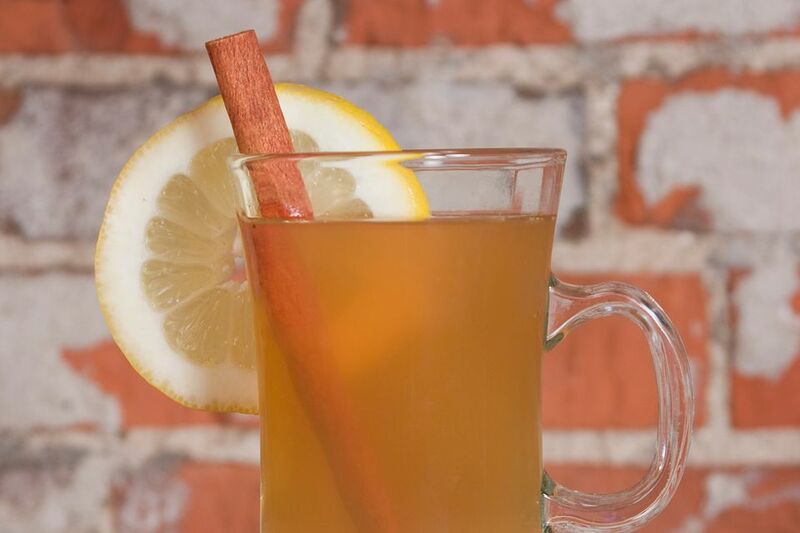 Essentially, anything you would put into a mulled wine or hot apple cider works great in a toddy. Any type of tea will make a great hot not toddy, so explore your options. Green teas are always nice because they're smooth and relaxing. Jasmine and Sencha are two great choices, though a black tea blend like Earl Grey is really nice as well. Mint teas and herbal tea blends (or tisanes) designed to calm and relax are perfect candidates, especially if you're making a toddy before bed or looking for cold relief. Floral teas such as those with chamomile, rosehips, or hibiscus can be a great pick-me-up for an afternoon toddy. With any of these, you might want to back off the spices a bit, particularly the cloves. For a citrus tea, you might want to stick with an orange blend. The lemon and peach tea blends are okay, but a spicy orange is best with this recipe. For a naturally caffeine-free toddy, try rooibos. It has a wonderful smokiness that gets new life with the toddy's ingredients. Honey is not the only way to sweeten this drink. Agave nectar is the same consistency as honey; it is sweeter than sugar but has a more neutral flavor than honey. Simple syrup is a nice alternative to straight sugar, and you can add extra flavor in it. Two homemade options that are amazing in a toddy are cinnamon simple syrup and brown sugar spice syrup. Does Hot Tea Really Cool You Down?